As we who have been born-again know; we were dead in our sins, and then when we received Jesus Christ and His resurrection power; we were alive in Christ. We suddenly became new creatures in Him, and everything old was passed away, and all things became new. That rebirth experience is a touch of what we will experience in the life to come. When we walk with our Lord Jesus everyday, in His Word and in The power of His blood; He increases in our lives and we decrease. It is a wonderful privilege. When I visited the “Garden Tomb” in Jerusalem; I felt The Lord’s Presence so intensely that I couldn’t stop crying. The power of The Resurrection was there in that place. It was very strong and undeniable. There is a war going on in the universe between the powers of good and evil. Those who take the more difficult road in life in order to obey God and to do good will be rewarded with the resurrection of life. The Lord Jesus , Himself endured the cross for the joy that was set before Him. We must never give up our hope in what the Lord has set before us. Those who endure to the end will be saved. Those people who choose the easy and broad road will suffer a resurrection, but it will be the damnation of their souls. Many people think that when they die; they will be gone for good, but they will continue on in hell where they will suffer great pain forever. The enemy of our souls is always trying to convince us of these lies and deceptions.. He is always trying to rob the true Christians of their blessings and their salvation. The more we die to the enemies’ lies and the more we die to our own flesh; the more we become holy. Our resurrection causes us to grow up into the image of Christ. Unless a grain of wheat fall to the ground and die; it remains alone, but if it dies; it will bear much fruit. We know in the parable of the sower that the seed fell on 4 types of soil, but only one seed out of 4 continued onward and upward in order to bear fruit, some 30, 60 and 100 fold. Be fore there is new life; there must be a death. Jesus freely gave His own life so that we could experience new life in Him forever. We can overcome everything evil in this world through the blood of The Lamb, Jesus, The Word of our testimony and we love not our lives unto the death. If we have fear; God cannot use us as overcomers. We must have His perfect love which casts out all fear. Fear has torment, and the enemy of our souls uses this evil spirit to thwart our effectiveness in the Kingdom of God. We, His children need to be holy as He is holy. We must die to ourselves and life to Him. We need to take one day at a time, and be led by The Holy Spirit of God and to fulfill His glorious plan for our lives. Many times, the Lord is presented as on the cross. In some plays and movies; the death of Christ was emphasized with not mention of His resurrection. When witnessing to others concerning the Lord’s death and burial; we must always include His resurrection. His resurrection provides the hope of our own resurrection and the resurrection of our loved ones. “If Christ “be not risen, our faith is vain” (1 Cor. 15:14). I believe that God’s people can have newness of life in this lifetime through faith and trust in The Lord and the power of The Resurrection. Moses had new sight and Caleb felt like he was 40 when he was 85. 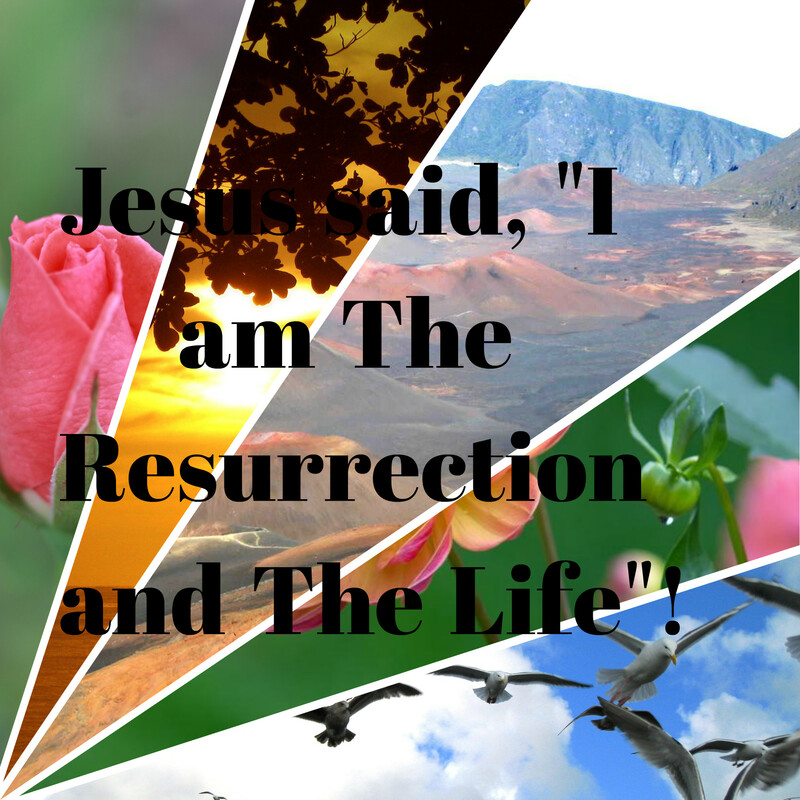 The Word “resurrection” means rebirth, renewal, regeneration. The whole of the New Testament speaks of the historic event of The Resurrection of Jesus Christ. There were countless witnesses that knew the Lord Jesus before He was crucified, and who also saw Him after He was raised from the dear. This great event was completed and thoroughly documented. However, the enemies of the Gospel still tried to send our false rumors against the Truth. It is the same today. The anti-Christ spirit is very strong as we are entering into the end time. Those that are righteous; be righteous still and those that are wicked be wicked still. Get right with God today so that you can be part of the power of His resurrection. There seems to be a great falling away in the church at large. However, remember that our wonderful Father, God has His people. He always has a remnant who will not fall away, and who will continue on until the end. The enemy is working overtime in his desire to kill, steal and destroy all that our Lord has given to us. The enemy was defeated at the cross, and he was destroyed at the resurrection of Jesus Christ. His time is short, and he is involved in every type of scheme to harm and destroy the Lord and His anointed ones as depicted in Psalm 2, Ps. 34 and Ps. 37. These psalms expose his evil plans, but it also confirms God’s total power over the devil and his demons. Praise God! I pray that each person and their loved ones will be able to experience the glorious salvation of the Lord and will attain to the power of His resurrection. Many are the afflictions of the righteous, but the Lord delivers us out of them all. May we all stand strong during these perilous times, and may The Lord receive all honor and glory in His precious Name. Amen, amen and amen. ← Does The ‘Shame and Blame’ Method Work to Change Student’s Behavior? Amen, Peggy! Jesus is alive and miracles happen every day!